Recently I've seen requests for "Green Bloggers" and was wondering what exactly that means? Should a blogger who switches between natural and main stream products really be classed as a "Green Blogger"? Clearly there are several shades of green (yes, I realise what I just did there!). Swapping out my skincare to natural products does not automatically mean that I will be out there hugging trees and saving the whales. However, using natural products generally means avoiding certain synthetic ingredients which could be harmful to the environment. Buying local handmade products supports the Country's economy and cuts down on air miles and carbon footprints. Often companies with Greener ethics are giving back to the local community and using recycled materials for packaging. Knowing what ingredients to cut out can be tricky. My advice is do your research and decide what is important to you, your skin and the environment around you. I have a page on my blog (under the header) which gives a basic list of ingredients which I look to avoid. I've argued many times that labelling a product natural does not make it a green product, so watch out for "Green Washing". Consider the products you buy, are you wasting food or not recycling packaging? Do you walk to the shops or take public transport or drive the car? If you have access to a garden, plant a vegetable patch or create a compost pile. Conserve water by not letting the tap run whilst brushing teeth or when washing up. Take reusable bags to the supermarket. If an appliance breaks down and is beyond repair, when buying a replacement consider the appliance energy rating. Obviously all the products I review are natural but here are some blog posts which have a environmental/green message. Are you taking your canvas bags to the supermarket? What does the term "Going Green" mean to you? Do you have any "green" tips to share with readers? Glad you enjoyed my ramble about going green :) The People Tree surprise box sounds interesting. I also keep foldable bags in every handbag, I did stop my veg box as I found myself wasting food, the quantity for one person was a little too much for me. Fab post, I have to admit that sometimes I dont think about all the things you have mentioned in your post, but I really should. I try and reduce my carbon foot print and recycle as much as possible, I also like supporting local businesses. Thank you Grace, even if you are only doing a couple of green things it's better than nothing at all. Well i am pleased to say i do at least half of these things which actually suprised me. I could still put more effort in though. Interesting points,Sarah!I've been planning to write about this kind of topic as well,and include your blog in it(I'll consider this comment as a permission also ;) ).Hope you don't mind! 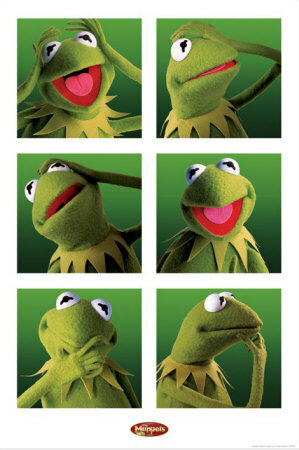 I was (and still am) a Kermit fan didn't seem right not to include him ;)If you can offset your carbon footprint in other ways then that is great. I think you have to be very dedicated to be truly 100% green but I want to enough people to do what they can.